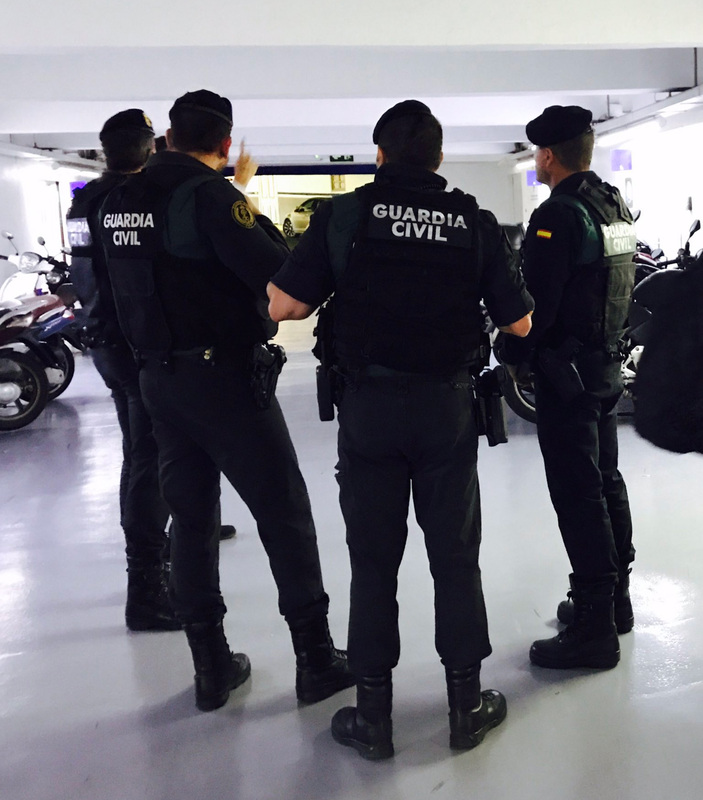 Photo posted by Fundació puntCAT‏ during the raid.The offices of the .cat gTLD registry Fundació puntCAT were raided by the Spanish police this morning. The company reported the incident via a series of tweets as the raid was being carried out. "Right now spanish police @guardiacivil is doing an intervention in our office @ICANN," was tweeted just about 4 hours ago followed by another tweet reporting that the police was headed to CTO's home. "We're wating for him to arrive to our office to start the intervention." Michele Neylon writes: "The move comes a couple of days after a Spanish court ordered the domain registry to take down all .cat domain names being used by the upcoming Catalan referendum. The .cat domain registry currently has over 100 thousand active domain names, and in light of the actions taken by the Spanish government, it's unclear how the registry will continue to operate if their offices are effectively shutdown by the Spanish authorities. The seizure won't impact live domain names or general day to day operations by registrars, as the registry backend is run by CORE and leverages global DNS infrastructure. However, it is deeply worrying that the Spanish government's actions would spill over onto an entire namespace." — Update – 20 SEP 2017: puntCAT's head of IT, Pep Masoliver, has been arrested as part of a Spanish government crackdown on pushes for independence, reports Kevin Murphy in Domain Incite: "He's been charged with 'sedition' and is still in police custody this evening… His arrest coincided with the military police raid of puntCAT's office in Barcelona that started this morning, related to a forthcoming Catalan independence referendum." — Fundació puntCAT releases statement: "The Fundació puntCAT wants to express its utmost condemnation, indignation and reprobation for the actions that it has been suffering lately with successive judicial mandates, searches and finally the arrest of our Director of Innovation and Information Systems, Pep Masoliver. ... The show that we have experienced in our offices this morning has been shameful and degrading, unworthy of a civilized country. We feel helpless in the face of these immensely disproportionate facts. We demand the immediate release of our colleague and friend." — Update 21 Sep 2017: EFF issues press letter condemning the police raid: "We have deep concerns about the use of the domain name system to censor content in general, even when such seizures are authorized by a court, as happened here. And there are two particular factors that compound those concerns in this case. First, the content in question here is essentially political speech, which the European Court of Human Rights has ruled as deserving of a higher level of protection than some other forms of speech. Even though the speech concerns a referendum that has been ruled illegal, the speech does not in itself pose any imminent threat to life or limb. The second factor that especially concerns us here is that the seizure took place with only 10 days remaining until the scheduled referendum, making it unlikely that the legality of the domains' seizures could be judicially reviewed before the referendum is scheduled to take place." "To Prevent Rebellion, Spain Docks Cruise Ship Housing 16,000 Riot Police In Barcelona Port"
"According to Reuters, the increasingly hostile crackdown by the Spanish police has led Catalan leaders to acknowledge for the first time today that plans to hold a referendum on independence are now in doubt following the arrest of senior regional officials and the seizure of campaign material by national police." Local Time: Thursday, April 18, 2019 05:33 AM PDT – Page Load: 0.2971 Sec.